The rocks found on many islands have settled after a journey that began deep within the Earth. Brought to the Earth's surface in eruptions of deep volcanic material, these rocks hold clues as to what is going on deep below. Studies of rocks found on certain volcanic islands, known as ocean island basalts, revealed that although these erupted rocks originate from Earth’s interior, they are not the same chemically. According to a group of current and former researchers at Arizona State University, the key to unlocking this complex, geochemical puzzle rests in a model of mantle dynamics consisting of plumes — upwellings of abnormally hot rock within the Earth’s mantle — that originate in the lower mantle and physically interact with chemically distinct piles of material. The team revealed that this theoretical model of material transport can easily produce the chemical variability observed at volcanic hot spots (such as Hawaii) around the world. “This model provides a platform for understanding links between the physics and chemistry that formed our modern world as well as habitable planets elsewhere,” said Curtis Williams, lead author of the study whose results are published in the Nov. 24 issue of the journal Nature Communications. Basalts collected from ocean islands such as Hawaii and those collected from mid-ocean ridges (which erupt at spreading centers deep below oceans) may look similar to the naked eye; however, in detail their trace elements and isotopic compositions can be quite distinct. These differences provide valuable insight into the chemical structure and temporal evolution of Earth’s interior. “In particular, it means that the Earth’s mantle — the hot rock below Earth’s crust but above the planet’s iron core — is compositionally heterogeneous. Understanding when and where these heterogeneities are formed and how they are transported through the mantle directly relates to the initial composition of the Earth and how it has evolved to its current, habitable state,” said Williams, a postdoc at UC Davis. 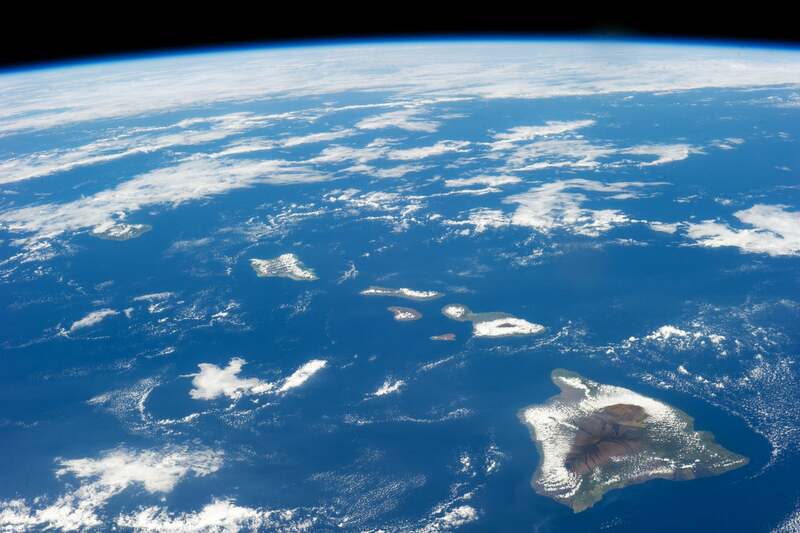 While a graduate student in ASU’s School of Earth and Space Exploration, Williams and faculty members Allen McNamara and Ed Garnero conceived a study to further understand how chemical complexities that exist deep inside the Earth are transported to the surface and erupt as intraplate volcanism (such as that which formed the Hawaiian islands). Along with fellow graduate student Mingming Li and professional research associate Matthijs van Soest, the researchers depict a model Earth, where in its interior reside distinct reservoirs of mantle material that may have formed during the earliest stages of Earth’s evolution. Employing such reservoirs into their models is supported by geophysical observations of two continent-size regions — one below the Pacific Ocean and one below parts of the Atlantic Ocean and Africa — sitting atop the core-mantle boundary. “In the last several years, we have witnessed a sharpening of the focus knob on seismic imaging of Earth’s deep interior. We have learned that the two large anomalous structures at the base of the mantle behave as if they are compositionally distinct. That is, we are talking about different stuff compared to the surrounding mantle. These represent the largest internal anomalies in Earth of unknown chemistry and origin,” said Garnero. These chemically distinct regions also underlie a majority of hot-spot volcanism, via hot mantle plumes from the top of the piles to Earth’s surface, suggesting a potential link between these ancient, chemically distinct regions and the chemistry of hot-spot volcanism. Helium-3, or 3He, is a so-called primordial isotope found in the Earth's mantle. It was created before the Earth was formed and is thought to have become entrapped within the Earth during planetary formation. Today, it is not being added to Earth’s inventory at a significant rate, unlike 4He, which accumulates over time. The variability of 3He to 4He in ocean island basalts is not only observed between different hot spots, but temporally within the different-aged lavas of a single hot-spot track. “The reservoirs and dynamics associated with this variability had remained unclear and was the primary motivation behind the study presented here,” said Williams. Williams continues to combine noble gas measurements with dynamic models of Earth evolution working with Sujoy Mukhopadhyay (professor and director of the Noble Gas Laboratory) at the University of California at Davis.